Successfully Added Long Range Walkie Talkies - 2.5KM Range (US) to your Shopping Cart. Long Range Walkie Talkies with strong 2.5KM clear signal range. This ergonomically designed pair of powerful walkie talkies, also known as handheld transceivers or 2-way radios, enable you to communicate with your partner up to 2.5 kilometers (approx. 1.55 miles) away. Instead of relying on a cellphone, these walkie-talkies are a practical alternative for both business and personal use such as keeping in touch in busy, crowded places such as trade fairs in large conference centers and vacation parks like Disneyland. Easy to use, these radio walkie talkies are also ideal for safety use when camping where cellular phone signals are not available. A handy built-in flashlight also provides the ability to send light signals or to provide additional illumination when required. 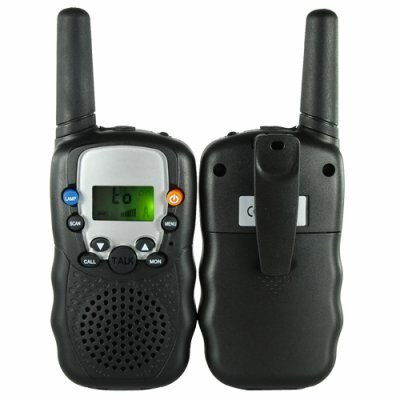 This powerful two walkie talkie set is brought to you no with M.O.Q. and ready to direct ship right to you or your customers door. Securely order your sample today from the leader in direct from China electronics, Chinavasion. Powerful walkie talkies with a range of up to 2.5KM. Enhanced by technology filtering out weak transmissions and interference due to surrounding terrain. Multi-channel scan without changing channels. Backlit display shows channel information, current volume, signal information and remaining battery power. These portable, two way radio transceivers feature technology that can actively filter out weak transmission and unwanted noise caused by terrain conditions. With these walkie talkies, you can always be confident of staying in touch. Can anyone buy and use these? YES! High power 2-way communication devices are not just for police and firemen anymore. These use open, public airwaves to send signals back and forth. Meaning there are no added costs like with a cell phone. They can be used as instant communication units and are popular with small maintenance and storage businesses, security companies, families on vacation with their children, and of course as just neighborhood fun.